WING KIT CONSTRUCTION - Page 6. 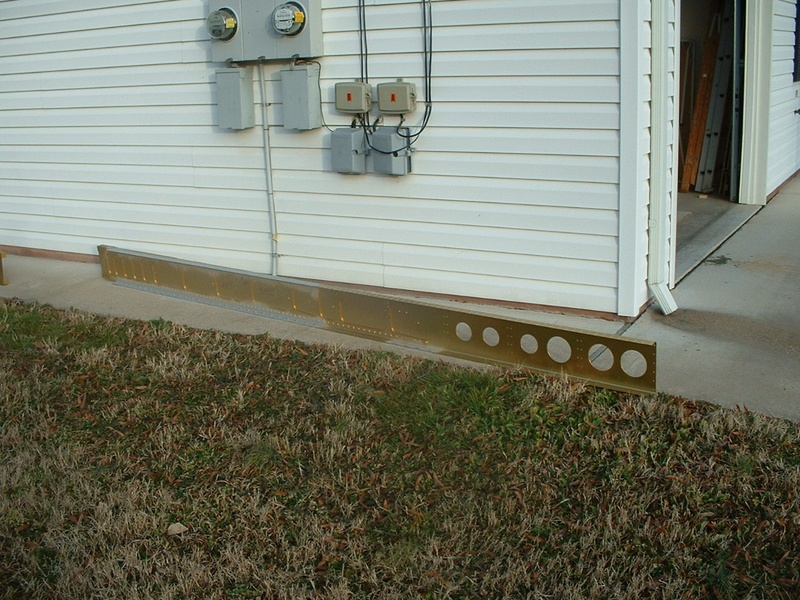 February 2, 2003: I now have the RIGHT wing OFF the construction jig. 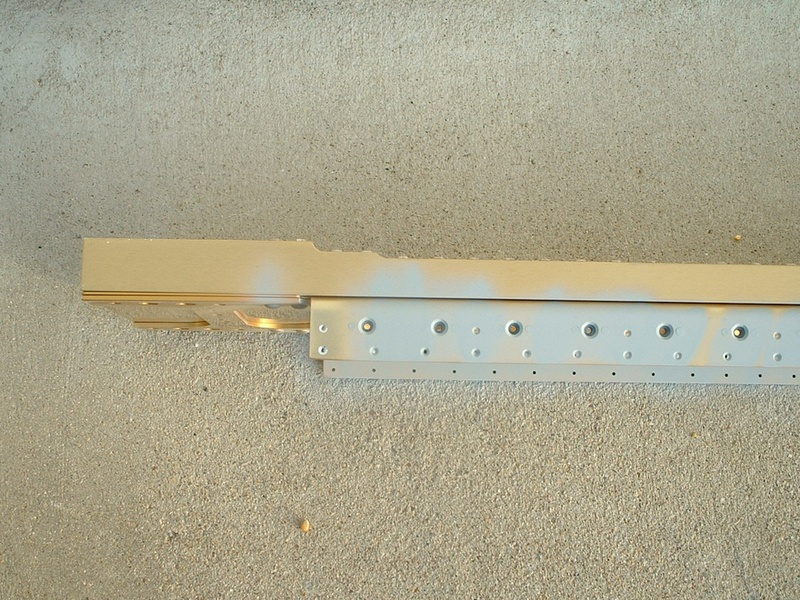 I spot-primed the main spars where the countersinked holes have cut through the gold anodized finish from the factory. 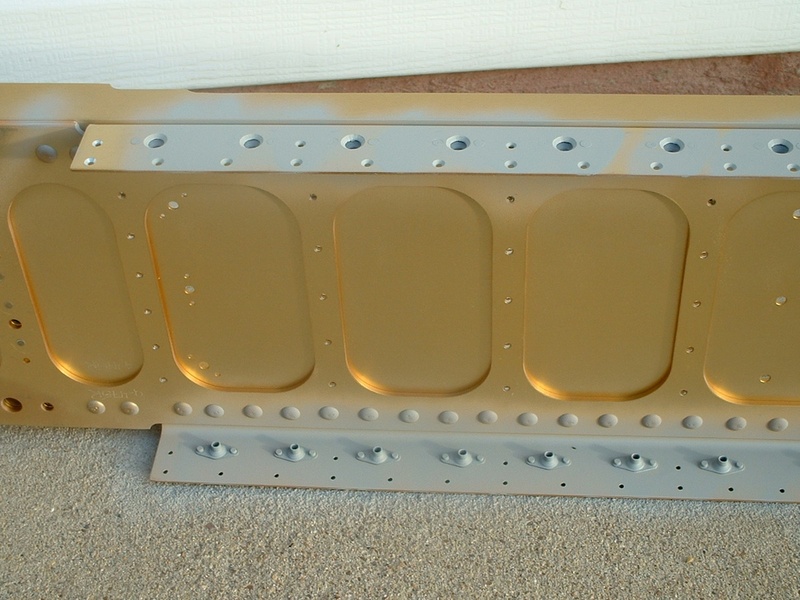 Yes, I know, gray primer, not gold, but it will be out of sight under the wing skins. 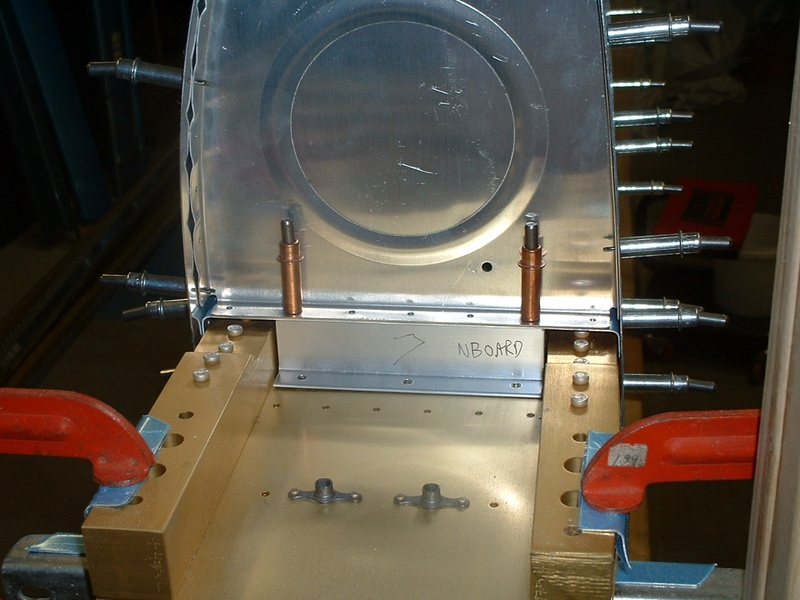 Here you can see some of the 62 large #8 plate nuts that are used to attach fuel tank skins to the main spar. As you can see, they are on the top and the bottom of the main wing spar. 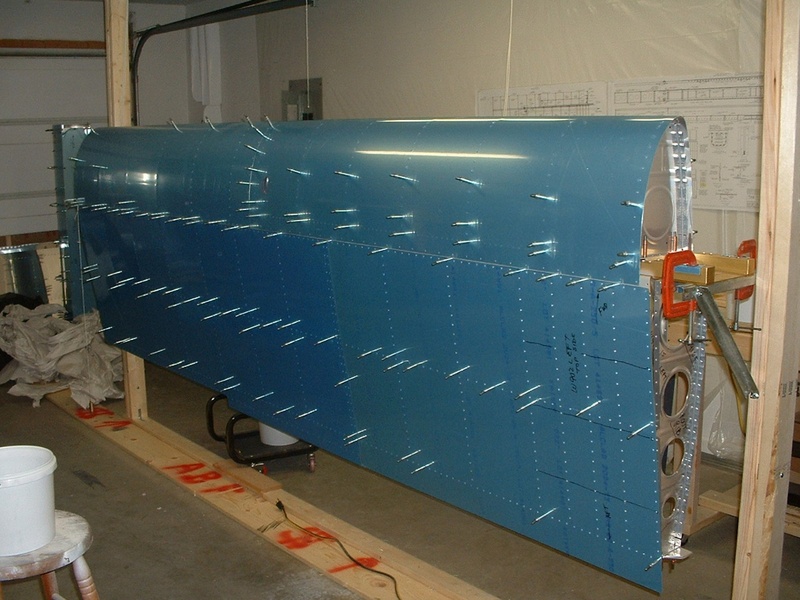 The smaller holes are to attach the main wing skins and ribs to the spar. This is the back side of the main spar. The fuel tank will sit on the front side of the spar and will also be secured by bolts as well as the #8 flat-head screws through the skin. I wanted to prime the steel plate nuts as well as the bare aluminum from the countersinked holes. That is the LEFT fuel tank under construction there just to the right of my garbage can. Those are the leading edge wing skins standing tall in the back ground. 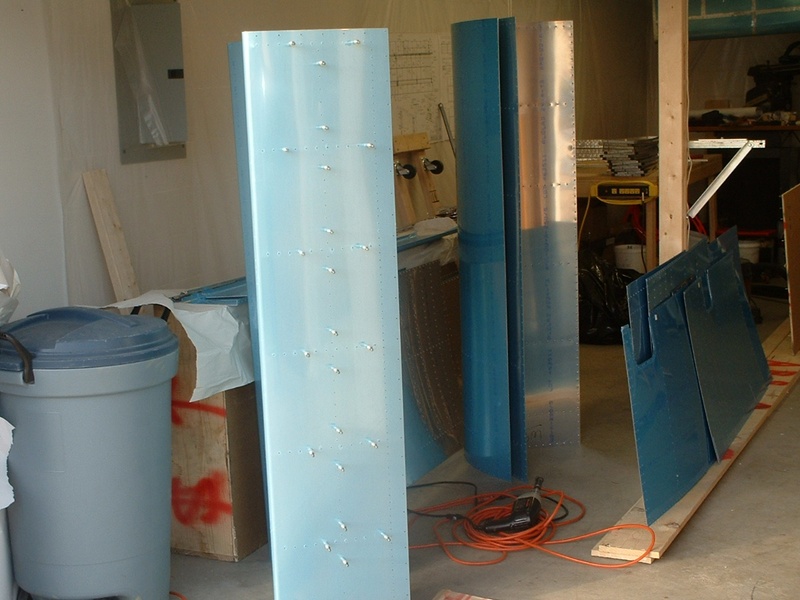 I have already stripped off the plastic on the inside of these skins and the ones that are leaning up against the shipping crate behind the fuel tank. The skins leaning up against the wing jig post are drilled and dimpled and also awaiting spray priming. It was a warm day here, but windy. I had to put the spars up against the end of the garage to get them sprayed out of the breeze. It was too windy to use the regular HPLV sprayer on the skins. My backordered wing kit parts from Van's are enroute UPS. February 10, 2003: After a week on the road for the company, I have returned and UPS delivered my two boxes from Van's. There was only ONE landing light kit sent, yet the packing slip said TWO were shipped. I sent Van's an email with the box number and the weight of the box. All the metal parts were shipped complete. I was able to get the left tank on the reassembled LEFT wing. I got all the holes drilled in the T-912 tank attach brackets. I have also converted the wing skin shipping crate into a wing cradle on wheels. I have to get some more padding installed on it before it will be ready to accept the assembled wings. I had a major shop cleaning today after doing the woodworking on the crate/cradle and before working on the LEFT wing tank. And you can see the top skins and the tank are now attached and all drilled. February 14, 2003: I have taken the LEFT wing off the jig and done a lot of priming of ribs, etc. I now have a big pile of green tinted aluminum and some skins that are corrosion protected. I now have the RIGHT wing on the jig for fitting of the RIGHT fuel tank.